On the 14th January 2018, the JKS calendar started with the first Black and Brown Belt training session, followed by the Open Squad. An excellent turnout was welcomed by Alan Campbell Sensei 7th Dan, Head of JKS England and Wales. Alan Sensei wished everyone a Happy New Year and reflected his intention for 2018 to build on a brilliant previous year for the JKS on both domestic and international fronts. 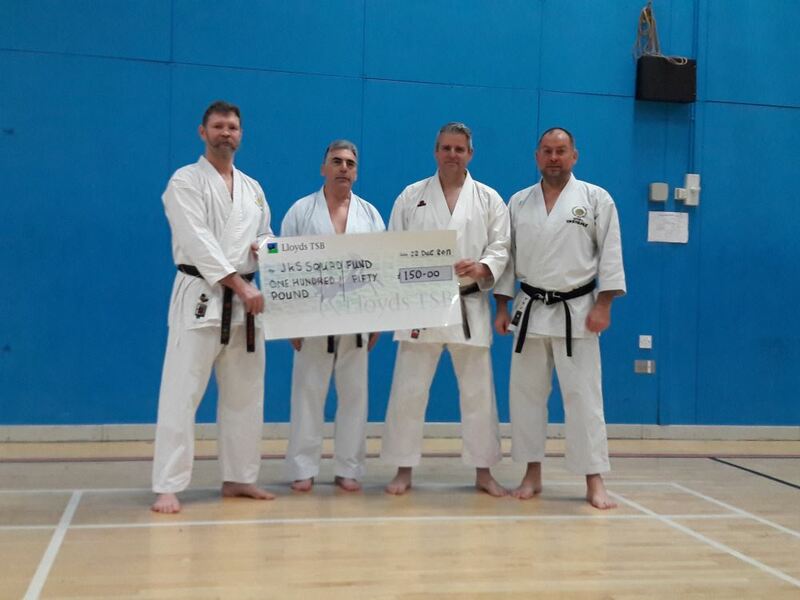 There was a cheque presentation of £150 raised by Tamashii Karate Club which was generously donated to the squad fund by Instructor Kelvin Rayner. The warm-up was most definitely needed on a cold winter’s morning and this was then followed by body conditioning exercises, just to remind people that Christmas should never get in the way of training! Working the arms and core, a sequence of squat gyaku-tsukis was then used to concentrate on the legs. Alan Sensei ensured that all students understood that a deep squat with good posture is a much more efficient way to make progress than a quick, shallow motion, rushing through the exercise. Punching to different angles, this exercise covered a lot of kihon principles including foot movement, hip drive, timing and stance work. Students were afforded enough time to repeat and this reminder of the vital nature of basic technique would form the laser focus of the rest of the session. Alan Sensei then covered a great deal of kihon combinations, found or adapted from within the grading syllabus. Beginning with mae geri-sanbon tsuki, Alan Sensei never failed to address often overlooked teaching points which should be ever present in a student’s mind. Establishing a strong hikite and maintaining posture, not only with the body but with the prepared hand was key to allow a strong, relaxed and straight punch to follow the kick. Timing, hip use in kicking/punching, height and relaxation were all mentioned in a thorough examination of each combination practiced. Sequences starting with mawashi-geri, gedan-barai, shuto-uke, ushiro-geri and yoko-geri were then utilised to reinforce the ideals stressed by Alan Sensei. Alan Sensei had also earlier commented on karate delivering a “whole body workout”, although not guaranteed, this is something which needs correct attention to detail, concentration during practice and repetition to establish. Trying not to underestimate the involvement of crucial body movements, Alan Sensei used this first session of the year to bring everyone back to the foundation of all karate; basic technique. No matter the level or grade, students were enabled to recall and improve elements of their technique which can impact greatly on the ability to deliver good kata form and kumite success. After a short break, Alan Sensei then cemented these thoughts further by looking at Heian Shodan and Heian Nidan in close detail. Working specific sequences and always pushing for complete technique throughout the whole kata, this saw students also appreciate each other’s karate, looking for areas to try to emulate or avoid. The session then came to an end with every student leaving with an apt reminder of the value of kihon with the martial art. attacks to further loosen the body, delivered to a static opponent, and pushed students to return to their guard quickly, not believing the technique is over when contact has been made. Matt Sensei then introduced his theme for the day which would encompass many kumite ideas but centre around the blocking structure used to combat common and fast kumite techniques. Working specific hands to certain attacks, students slowly built up the need to recognise attacks and quickly respond, all the while maintaining good focus, avoiding big unnecessary arm movements and allowing the potential for a counter-attack. Saving time and working within this “structure”, Matt Sensei said, is a vital skill which needs practice to become habit. Avoiding flinching and blinking was also key to enable students to be unaffected by oncoming attacks (even if not blocked). This gives nothing away to your partner and with time, will allow a very economic form of protection and solid base for kumite movement. Matt Sensei, then introduced kicks to try to beat this guard, after having worked first on punches. Using a specific order, students had to concentrate greatly on a number of points, all resulting in the defender doing as little as possible but to maximum effect. Working the attacking techniques in a different order next heightened the need for correct response. Finally this moved to any attack which increased the unpredictability and varied the complexity, however students were always brought back to the structure permeating the session. Using a wall to aid the defender, the attacks started to mimic more complex kumite attacks and reflect a fighting experience. In turn this showed the benefit of good a good guard, posture and structure in protection, but also facilitates the ability to attack when the opportunity presents. A single hand was then used to test student’s resolve, difficult when changing partners which students had been doing since the start of the session. This then morphed into using the opposite hand than a student would usually recruit, addressing an earlier point Alan Sensei said about the restriction of techniques which might be imposed if the body is injured or affected in an exchange. Matt Sensei then finished with demonstrating a quick sweep but without mats, left the students wanting more. With smiling faces and tired legs, the day came to an end and was an excellent way to begin the New Year.